Find the perfect solar panel kit for your renewable energy project with our reviews and guide. Find out all about sizing your installation and setting it up in our buyer’s guide. With the planet suffering from the side effects of years of non-renewable energy consumption, it’s never been a better time to go solar. Solar panels are now more affordable and more efficient than ever. 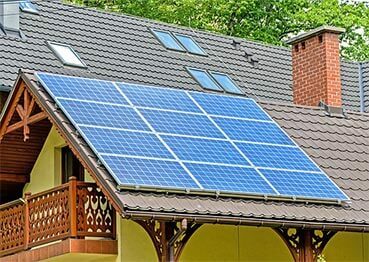 In this post, we’ve compiled a list of the best solar panel kits for small homes. We’ve been careful to cover a variety of budgets and power requirements. 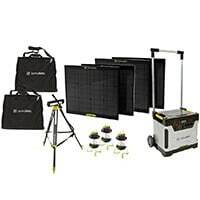 Our recommended kits include a portable 40-watt system for traveling and a huge 3600 watt kit that can power a small home. We’ve also included our favorite grid-tied and off-grid tiny house solar kits. Solar has only recently become a viable energy source. Recent technological advancements have significantly reduced the cost of such a system, and they are now more energy efficient than ever. However, they are still massively underused. Here are 3 huge reasons why we should all make use of solar energy. 1. It’s so much better for the environment. Our most used power sources produce emissions that damage the environment. Solar power however, is completely clean and renewable. Now, there’s obviously energy used in making the actual solar panels, but according to this report it only takes between 6 to 18 months for this energy to be recouped, and the system to repay the energy used in its construction. Carbon monoxide – contributes to the greenhouse effect. Carbon dioxide – contributes to the greenhouse effect. Nitrogen oxide – contributes to ground-level ozone (damages the lungs). Sulfur dioxide – causes acid rain, and worsens respiratory illness and heart disease. Particulate matter – causes smog in cities. Also contributes to asthma, lung cancer, chronic bronchitis, and emphysema. Heavy metals (lead, mercury etc.) – these can be very bad for human health. The more we use renewable, clean energy sources like solar power, the less of this harmful pollution get pumped into the atmosphere. 2. It has fixed energy costs. Ever been angered by a hike in electricity price? You’re not alone. 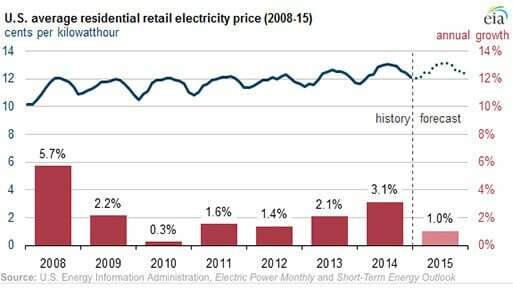 Utility providers seem to have complete impunity when it comes to raising prices without reason, and the price seems to rise year after year. The great thing about solar power is that the price is set at your initial investment. If the price of oil fluctuates, that has absolutely no bearing on your electricity costs. In fact, with a solar installation, you can wave goodbye to dreaded electricity bills. If you have a capable enough installation you can provide your household energy independently. Now, that would be a good feeling. 3. A solar energy system can earn you money. This can happen in 2 different ways. a) If your solar energy system is grid-tied, then you have the option of selling any surplus energy that you produce, back to the utility company. In some states, this gets even better. The Renewable Portfolio Standard (RPS) demands that electricity companies create increasing portions of their electricity from renewable sources. Some invest in projects of their own, but many prefer to buy surplus energy from independent sources like me and you. This has created a Solar Renewable Energy Certificate (SREC) market. If your system is creating more energy than you need then you can sell this at a premium price. b) Solar panels can also increase the value of your property. A study from the Lawrence Berkeley National Lab concluded that homes in California add an average of $4 for every watt of power, and homes elsewhere adding $3. That means a 5 kW solar kit could add as much as $20,000 of value in California, and $15,000 in other states. Solar power systems look pretty simple and basic on first look. Just a shiny, black panel pointing to the sky. However, there’s a lot of clever engineering going on behind the scenes, and that shiny, black panel isn’t the only component needed to harness the power of the sun. The science is pretty complicated, so we’ve tried to give a rough idea of what goes on behind the scenes, without getting too technical. If you’re keen for some heavy science then check out the video below. The common solar panels that are seen on people’s roofs are photovoltaic. This word is derived from the Greek word phōs, which means “light” and the unit of electricity, the volt. Photovoltaic (PV) panels transform the sun’s light into electrical energy for us to use. PV panels use something called the photoelectric effect to produce electricity. This is when certain materials produce a small amount of electric current when exposed to strong light. Solar panels use small devices called solar cells to convert the sunlight into electricity. Individually, solar cells don’t produce much electricity, but when many cells are combined to make a solar panel, we can make significant amounts of energy. These panels can then be combined to make arrays, and the effect is increased again. Inside the solar cell, there are 2 extremely thin layers of silicon. The top layer has been treated so that its atoms aren’t stable. They actually have too many electrons, and are desperate to get rid of them. On the bottom layer, the opposite is true. This layer of silicon has empty spaces and needs to fill them with electrons. This difference in the state is the perfect situation for electricity to be produced. The two sheets of silicon are itching to transfer electrons, but they need a catalyst or conduit for the transfer to take place. As the sunlight hits the top silicon layer, it gives the electrons the push that they need. This starts a flow of electrons between the silicon layers. A flow of electrons is in fact an electrical current. However, the electricity produced by sunlight in a solar set-up isn’t perfect. It is direct current (DC), while the electricity we need in our homes is alternating current (AC). This means it needs to be altered before we can use it. This process is done by an inverter. Having an efficient inverter is a big part in any successful solar set-up. So, you’ve made the decision to use solar power. The big step before choosing a kit is estimating the amount of energy that you need to produce. Are these solar panels for tiny houses or for camping? How much of your power do you want to supply using solar? 100%? 50%? 10%? Well, the first thing to do is measure the power output of your home. That means identifying all the appliances that draw current and measuring their power consumption. This sounds really difficult, but it’s really not. To measure the energy consumption of household appliances we need to use an electricity usage monitor. These are relatively cheap, and very easy to use. We recommend the Kill-A-Watt Meter. This meter is awesome because it can tell us how much power is being consumed at any given moment, and also how much power is consumed over time. To get these answers, all you need to do is plug your appliance in and press a button. Even if you don’t invest in a solar installation, this inexpensive meter can show you where you can make big savings on your electricity bills. Next, we need to split up the household appliances into 3 groups. These groups are determined according to how the appliance draws power. We need to measure the energy usage of each kind of appliance in a different way. Next, we’ll run through what we need to calculate in each group and exactly how to do it. There’s a table at the end which shows all of the information that you should be recording. These appliances are always plugged-in and draw continuous power. This group includes things like freezers and fridges. To measure this, we need to let the meter run for 24 hours. We need an answer in Watt Hours. To do this we press the KWH button, and then multiply by 1000. For example, pressing the ‘KWH’ button might give an answer of 0.5 KWH. We multiply 0.5 by 1000 to give an answer of 500 Watt Hours. With these continuous use devices, we also need to measure how much instantaneous power they use. This information is important for measuring the size of the inverter that we need. To do this we just need to press the ‘Watt’ button. To recap, for these devices we need to record two things. The energy usage over 24 hours (in Watt Hours) and the instantaneous energy usage (in Watts). These are the devices that we control by turning them on and off. Their energy consumption is constant over the time that we use them. This group includes things like radios, computers, fans, lights, coffee machines, and ovens. To measure this we use the ‘Watt’ button on the electricity meter. Just press it when the device is being used. The second step here is to multiply this answer by the number of hours each day that you use the appliance. For example, a fan draws 60 watts and is used for 5 hours each day. The total energy consumption for the day is 60 x 5 = 300 Watt Hours. This group of appliances are things that aren’t constantly used, but the amount of power that they draw can change over the time of their use. An example of this would be a washing machine that goes through various cycles. This group includes devices like computers, washing machines, fancy microwaves, and rechargeable devices. To measure this we need to record the energy usage over one complete cycle of use. This means we need to record the energy usage of recharging a phone from start to finish, or the washing machine from start to finish. Remember, we need the answer in Watt Hours. So press ‘KWH’ at the end and then multiply by 1000. We also need the peak energy usage in order to size the inverter that is needed. To do this, press the ‘Watt’ button during the process and record the highest reading that you see. Add up the total power consumption in Watt Hours to give your total energy requirements. Now, the number is likely to be quite large, so unless you have a huge budget, some sacrifices might have to be made. Some appliances are more important than others. Furthermore, other methods might be more energy efficient and practical. Next is to size the inverter. The inverter is a critical component as it changes the DC current produced by the solar array into usable AC current for the home. To estimate the size of your inverter you need to use the Instant Power and Peak column in your table. By adding these up you can estimate the load that the inverter will have to handle. You need to consider the maximum amount of power that will ever be used at one time. If you plan on running a freezer, oven, radio, and lights at the same time then you have to account for this. For example, a 2000 watt inverter can handle the energy demands of up to 2000 watts at one time. The Kill-A-Watt meter is awesome, but there are some things that it just can’t measure. Not to worry though, as with some basic math we can work these out too. The first thing to do is check the device’s rating. There will be a tag on it somewhere that should give this information. If you see a value in watts then multiply this by the number of hours each day that you use it for. If you simply see a value for Volts and Amps, then some simple math is needed. First, multiply the voltage x current. Then, multiply this answer by 0.85. Finally, multiply this answer by the number of hours each day you use it for. An appliance is used for 5 hours each day and is rated at 120 V and 0.6 A. Things like sump pumps are rated in horsepower. One horsepower is equal to 745 watts. If you have a 1/4 HP sump pump then you would divide 745 by 4 to get the wattage. We know how much energy we need to produce, but now we need to know how we can reach this total. To do this we need to find out the average number of sun hours that your area receives each day. You can find this information out using the maps on the National Energy Renewable Laboratory website. You’ll find an image like the one below, but in higher resolution. The final step is to multiply the number of sun hours you receive by the size of the solar array that you are considering. If you receive an average of 6 sun hours each day where you live, and you are considering a 1000 watt solar array, then you can produce 6000 Watt Hours of energy on average each day. If it’s a map like the one above, you have the information you need over an area. You would need to measure the area (in square meters) of your solar array to estimate the energy yield. Buying a solar kit can be an expensive investment, so make sure you know exactly what you’re getting. In this section we run through the key features you should be looking at, and the steps you should be taking before you buy. Know exactly what you’re looking for. By this we mean make sure you know how much energy you need to harvest, and how big a solar array you need to to provide this kind of energy. If you’re not sure how to do this then check out the previous section ‘How to Size Your Solar Installation’. There’s a second point here and that is to make the decision about going off-grid or staying grid-tied. Grid-tied means that your installation is metered. You are credited for putting any excess energy back into the grid. These systems need approved by your local energy utility before they can be used. To be grid-tied you would need a permanent residence. Grid-tied systems don’t use batteries as energy is just taken from the grid when needed. This means that they are more efficient. The deep cycle lead-acid batteries that are commonly used in off-grid installations, only run at about 80% efficiency. The inverters used in grid-tied systems are usually more efficient too. They are cheaper and some are even fan-less. Off-grid means complete energy independence, with no ties to the national grid. Off grid solar kits are perfect for the traveler, with no fixed address. The real bonus here is that you are able to travel where you please and harvest energy from anywhere. These systems aren’t quite as efficient as grid-tied systems, but that’s just the price you pay for freedom. A solar powered tiny house would usually fit into this category. Have a firm idea on where you will install the panels. Most kits don’t come with racks to mount them on, and installing them on the roof isn’t always possible. Roofs aren’t an ideal place for installation, especially on tiny houses. There usually isn’t much space on the roof, and having them up there makes cleaning and maintenance very awkward. Remember, you want the most sunlight possible in order to yield the most energy. If you plan to move around a lot, then having some panels that you can carry to the optimum spot might be more practical. If you have an RV, tiny house, or boat and you’re able to move your home, then installing panels on the roof doesn’t make much sense. It means in hot summer months your home can’t be in the shade. You can easily make your own racks on which to hold your panels with some good wood. Check what’s included in the kit. Though all of the systems we have reviewed are labeled as kits, they don’t all come with the same hardware. One point of note would be the batteries. Most kits don’t come with batteries included, and this is something you would have to budget for. Another point would be the racks to mount the solar panels on. 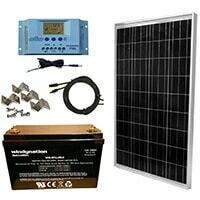 The best solar panel kits come with charge controllers, panels, and wiring all included. How efficient are the solar panels? The two main choices with the panels are: monocrystalline or polycrystalline. Monocrystalline panels are a bit more expensive, but they are more efficient. They work better in hot weather (solar panels drop in performance when very hot), and can reach efficiencies of up to 22%. 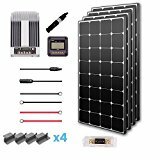 Cheap solar panel kits tend to come with polycrystalline panels, which aren’t as efficient and won’t convert as much sunlight into usable energy. How efficient is the charge controller? The two main choices here are: PWM or MPPT? PWM charge controllers are much cheaper, but aren’t as efficient as the MPPT competition. If you have a small installation then the difference might not be that noticeable, but in big installations, MPPT is a must. Find the perfect charge controller for your installation with our guide to MPPT solar charge controllers. If you’re making a big investment, then make sure you’re covered by a decent warranty. Modern solar panels are a lot more sturdy than 10 years ago. The best home solar kits should last decades. These are the top rated solar panel kits available right now. We’ve included everything from portable 40 watt kits for hiking, up to 3600 watt kits that can power small homes. All the relevant information is in the comparison table. Each column can be sorted according to what matters most to you. There are more detailed reviews of each kit following the table. - Charges laptops, phones etc. These are the best solar panels for RVs, and also the top portable solar panel kits. We’ll start with the smallest and work our way up. To see how they compare to each other, don’t forget to check out the comparison table above. The X-Dragon is a portable solar panel kit with quite a reputation. It’s the perfect solution for the explorer that needs to keep in touch with the world. It’s small enough to fit in a backpack, but efficient enough to power multiple electrical devices from the sun. It’s the X-Dragon’s efficiency that make it a standout portable solar panel. It is built with Sunpower solar cells that work at an amazing 22-25% efficiency. This figure is way beyond what most solar cells can achieve. Typical values for efficiency are usually around the 15% mark. The X-Dragon can use this power in clever ways too. It is able to automatically adjust the voltage and current to give maximum power delivery. It has 2 power output connections. There’s a USB port (5 Volts/2 Amps) and an 18 Volt DC output. The USB port is perfect for charging smaller gadgets like phones, while the DC output is for bigger devices like laptops. The kit also comes with 10 laptop connectors to cover all sizes and variations. It’s a really convenient size too. It folds away to just 10.43″ x 6.30″ x 2.76 ” and weighs just 3 pounds (if you need something even smaller, then check out the 20 watt model that only weighs 1.65 pounds). It’s got eyeholes to attach it to a backpack, and is perfectly at home indoors and out. You can be assured of its build quality too. The X-Dragon meets RoHS guidelines and is CE certified. In fact, it has surge protection and short circuit safety technology to prevent accidents too. Bottom Line: In our opinion, this is the best portable solar panel around. It’s slim, powerful, and extremely efficient. This Renogy solar kit has everything you need to start harnessing the power of the sun (minus the deep charge battery). It’s perfect for RVs, boats or any grid independent set-up. 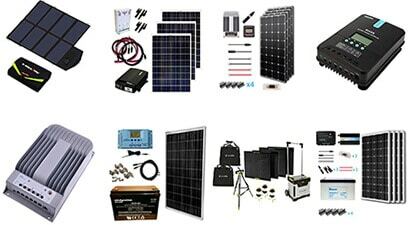 The kit includes: a 50 Watt monocrystalline solar panel, a 10 Amp PWM charge controller, a 20 feet 12AWG MC4 adaptor kit, an 8 feet 12AWG tray cable, and a set of Z-brackets. The solar panel has an efficiency rating of 18.4% which makes it one of the better quality panels of this size. It also contains bypass diodes that minimize the drop in power caused by shade and low-light weather. This means it is still able to collect a decent amount of power on days when the sun is not shining so much. The solar modules have been EL tested to ensure that there is no hot spot heating. 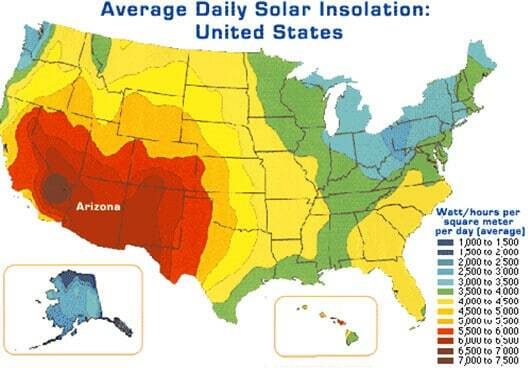 Hot spot heating occurs when one “bad” solar cell limits the overall output of the whole unit. It can be very damaging to the physical structure of the system. The panel also has a corrosion resistant aluminum frame that is perfect for extended outdoor use. It has pre-drilled holes on the back that allow it to be mounted quickly and securely. The system is actually guaranteed for 25 years (power output) and 5 years for the labor and parts. Bottom Line: This Renogy solar kit the perfect entry level system, and one of the best solar kits for beginners. The power output is not huge, but it’s one of the best solar panels for sailboats, RVs, and smaller operations. It’s also very highly regarded by customers on sites like Amazon. This smaller sized kit from WindyNation comes with everything you need to start using solar power. Most kits don’t come with a deep cycle battery, but this one does. As it is, the kit can provide an average of 350 Watt Hours (Wh) of energy, or 33 Amp hours of power charge every day. These figures are for optimal weather conditions though, so they will vary. If you’re in need of more juice then check out the bigger 400 Watt model. A nice feature with this kit is that it is easily upgraded. Should you have higher power demands, then more solar panels can be added. The charge controller that is included can take up to 4x 100 Watt panels in a 12 Volt system, or 8x 100 Watt panels in a 24 Volt system. The 100 Watt solar panel measures 40″ x 26.4″ x 1.2 “. It works at a high degree of efficiency, and performs well under high temperature and low light weather conditions. The 30 Amp PWM (pulse width modulation) controller has multiple safety features. There is overload, reverse polarity, and short circuit protection. It has an LCD display that provides important details about the voltage, state of charge, temperature, and the current solar panel condition (to name a few). Its settings are easily adjusted using cycle and mode buttons. As we mentioned previously, there is plenty of headroom with this controller if you need to upgrade the system. Bottom Line: This kit has everything you need to get going. We love the fact that it can be easily upgraded with additional panels. It’s more expensive than other 100 watt systems, but then this one comes with a battery included. The Grape Solar GS-300 is an off-grid kit rated at 300 watts of power. It achieves this using 3x 100 watt polycrystalline panels. It is the ideal set-up for charging a 12 Volt battery, and could easily be used on RVs and boats. The panels are finished with an anodized aluminum frame and a sealed junction box. This makes them perfectly suited to changeable weather conditions. They also have a two diode bypass in the circuitry that minimizes any power drop caused when the sunlight is blocked. As it is, the system is capable of providing around 900 Watt-hours or about 75 Amp-hours of charge every day. However, the kit can be expanded with the addition of extra solar panels. The Grape Solar charge controller is perfect for a wide range of kit uses. It can be operated in 12 Volt or 24 Volt modes, and it has a multi-color LED display to show the current charge status. When using the 35 Amp input it allows the addition of two more 100 watt panels. This would take the total up to 500 watts. The Xantrex inverter gives True-Sine Wave AC output of 2,000 watts. This is essential if you wish to power household appliances with the kit. It is able to withstand the high levels of electrical surge that occur when powerful appliances like power tools and microwaves start up. The PROwatt inverter also includes a USB output, so it can easily charge devices like cell phones. Bottom Line: This is an attractive kit that is easily set-up. The inclusion of an inverter means it’s ready to supply AC power to your home. The Renogy Premium Kit comes with some of the best quality small solar panels available. These 100 watt Eclipse panels are low weight and highly efficient. The monocrystalline panels offer an efficiency of 18.4%, which is very high. They are also equipped with bypass diodes that minimize any drop in power caused by times when the sunlight is blocked. This gives them very good performance in low light environments. The panels are also built to last. They use extra thick tempered glass that is highly transparent and anti-reflective. This material makes them durable and resistant to impacts. They are also framed in aluminum that is corrosion resistant and built to last for decades. 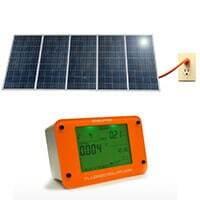 Besides using Renogy’s best solar panels, this kit also uses a high quality 40 Amp MPPT charge controller. The maximum power point tracking (MPPT) technology maximizes the amount of power that can be produced in any situation. This makes this system as efficient as possible in each weather condition. The controller also uses something called multiphase synchronous rectification to increase the charging efficiency. This charge controller gives peak conversion efficiency of 98% and high tracking efficiency of 99%. This 400 watt solar panel kit also has safety a top priority. The controller has numerous safety features. These include short circuit protection, reversed polarity, overload, and overcharging protection. The MT-50 tracer meter monitors the system performance. It monitors 8 electrical parameters to give an accurate assessment of the system’s performance. It can also identify any broken or faulty components. The MT-50 is designed to work perfectly with the charge controller included in this kit. Bottom Line: This Renogy solar kit comes with some impressive panels and an awesome charge controller. It can easily be installed off-grid in a ground mount system, which makes it perfect for those wanting to leave the power grid behind. 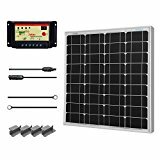 This is a great solar panel kit for RVs, sailboats, and a top tiny house solar kit too. These kits are better for tiny houses and cabins. 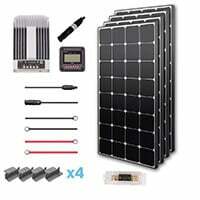 We’ve included both the best grid tied solar panel kits and off grid solar kits. We’ll start with the smaller kits and work our way up. 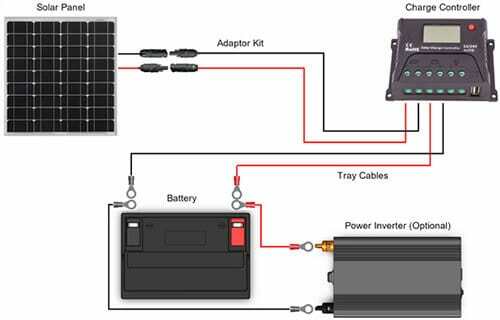 This off grid solar kit is built with portability and usability keenly in mind. It includes carry cases, and even portable tripods to mount the solar panels. This kit is complete and ready to go. Unlike some “kits” this one has everything needed to start using the sun’s power. It may be a bit pricier than most, but I guess that is what you pay for convenience. It wouldn’t be enough to power a home, but it is a perfect back-up system for those times of crisis. Bottom Line: Top design and usability. It is on the pricier side, but it brings complete convenience and portability. The generator is high quality and runs silently, and without any emissions. 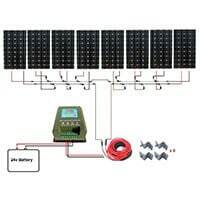 This is the first of the larger non grid tied solar kits we have included. It is rated at 1300 watts and comes with an MPPT solar charge controller. 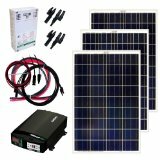 This off grid solar kit is ideal for an off-grid power supply. In ideal conditions, it is capable of producing 6KWh each day. Of course, you will need a 24 Volt battery to store the charge (not included). 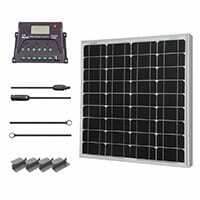 The kit comes with eight monocrystalline solar panels, rated at 160 watts each. Monocrystalline cells offer the highest efficiency performance for their size. They have aluminum frames that are corrosion resistant and built to withstand the effects of bad weather. They are built to withstand wind pressure of 2400 Pascals, which works out at speeds of over 200 km/h. The panels also use by-pass diodes that ensure top performance in low light levels. The diodes minimize any drop in power. The solar charge controller uses maximum power point tracking. This technology is much more efficient than regular PWM technology. It has multiple built-in safety features, such as: over charge protection, open circuit protection, overload protection, and short circuit protection. It also has an LCD display to give the current system status and charge levels. Please note that this kit does not include an inverter or battery. If you wish to power household appliances then an inverter is needed to change from DC current to AC current. It requires a 24 Volt battery to store the charge. 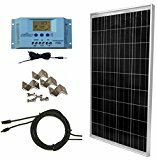 Bottom Line: This off grid solar kit has efficient and durable panels and a decent charge controller. It’s a good place to start for the larger of the kits. This size of kit would work great for a cabin or tiny house that doesn’t need huge amounts of power. This is the only grid-tied system in our list. It includes six 240 Watt solar panels that can be easily attached to a roof or mounts using PluggedSolar’s patent pending technology. The kit is designed to be easily set-up, without the need to hire a professional. You can see how easy it is in this video. Being a grid-tied system you must acquire your electricity companies approval before you try to feed electricity back into the grid. The kit comes with all of the necessary documentation for this, and the kit is UL certified (as required by law). When you consume less energy than is made by the solar panels, the electricity goes back to the grid. This rotates the electricity meter backwards, giving you credit. When you consume more power than is generated by the panels, the meter rotates forward, as it would normally. The kit uses a UL approved grid tied inverter. This converts the DC electricity that is made by the solar panels, into usable AC electricity. The inverter synchronizes the electricity voltage, phase, and frequency with that used by the utility company. It is then ready to be transferred to the grid. The kit is capable of producing 3000kWh of energy every year. The panels have a 25 year warranty, and the system for 5 years. This kit may entitle you to a 30% tax credit. Bottom Line: This is a great kit for getting started. It’s really easy to set-up and just requires approval from your local utility before you start getting electricity credit. 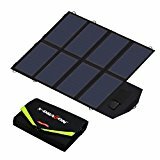 This off grid solar kit from Renogy is rated at a huge 3600 watts. It’s perfect for powering an off-grid project like a tiny house or cabin. 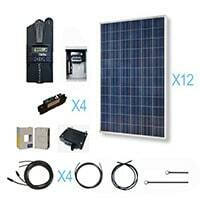 This kit consists of twelve 310 watt polycrystalline panels, but it can be upgraded should you wish. The kit doesn’t include the battery packs, which you would have to purchase separately. 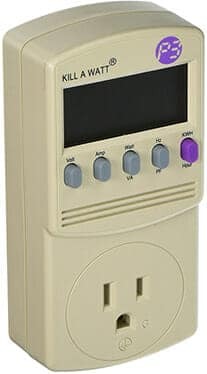 The MidNite Classic MPPT charge controller is one of the safest models around. It uses Arc Fault Detection to ensure the system is immediately shut down in the event of any weak points forming in your installation. This type of system monitoring is one of the safest and fastest at identifying problems. 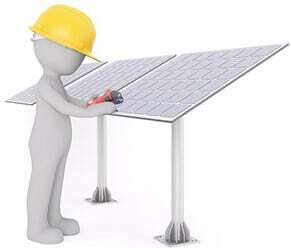 It also ensures your solar installation is safeguarded against electrical fires. A battery temperature sensor is included too. It is also able to handle a great variety of DC input sources. It is designed to handle 12, 24, 36, 48, 60, and 72 Volt battery banks (it is rated for 79 Amps). The MidNite Classic controller includes solar, wind, and hydro MPPT modes. This means it is designed to regulate the DC input from all of these kinds of inputs. It also includes a voice guided help system that walks you through the installation process. Using MPPT technology, it is much more efficient than the regular PWM based systems. This is really important with these larger installations. The MidNite Solar MNPV6 combiner box is perfect for outdoor use and has room to further upgrade the system. 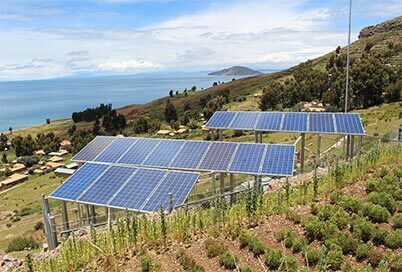 Bottom Line: The system is the perfect size for small off-grids installations that need to power a few household appliances. It uses a quality charge controller to safeguard the system, and it has great solar panels for tiny houses too. That’s all for our big guide to small solar kits. To be notified of more articles like this going live then make sure to follow us on Facebook or join our mailing list.